The Young Women's Christian Association Haiti (YWCA-Haiti) is a foundation created in 2008 and affiliated to the World YWCA since 2011. The goal of the YWCA Haiti is to promote the leadership of women and girls in Haiti, so they can contribute to the development of their communities and country. Our main focus is on three key issues: education, health and leadership. The vision of the World YWCA and the YWCA Haiti is that of a world, without exception, in which justice, peace, heath, human dignity, freedom and the preservation of the environment are promoted and supported through women’s leadership. The mission of the YWCA Haiti foundation is to develop the leadership of women and girls so they have the power to create positive changes in their lives ,their communities and their country. Since April 2010, we have been mentoring young women aged 8 to 30 from certain disadvantaged areas of Pétion-Ville such as Bristou, Meyotte, Girardeau, Nerette, Morne Lazarre, Peguy Ville, Berthe, Morne Hercule. Our staff manages two key programs: the Youth Center and the Leadership Academy. 1 .After school tutoring – after school from Monday to Thursday, provided by our mentors and certified teachers. 2. Safe space — every Fridays and Saturdays animated by our mentors and volunteers. They participate in workshops on leadership ,self-esteem ,financial literacy, gender-based violence, sexual and reproductive health, the environment, human rights, inclusion, using innovating teaching materials. Girls also participate in recreational and creative activities such as yoga, crafts, dance and much more. The Leadership Academy serves around 300 young Women aged 18 to 30 years old each year. This 10 week training program is repeated four (4) times a year. In order to empower women, YWCA members and field experts lead workshops on women’s empowerment, environment, work ethics, human rights, gender-based violence, sexual and reproductive health, HIV/AIDS, leadership and self-esteem. Girls and young women who benefit from the programs are often orphans, live with 1 parent or other family members, have little or no schooling, and / or are survivors of gender-based violence. They live in poverty and often, the hot daily meal we offer them is the only substantial meal of their day. • Girls education: tuition fees for one girl. • Health Care: HIV testing twice a year, deworming treatment, general medical check-ups. • Psycho-social support: YWCA Haiti offers Psycho-social support to its participants, helping them overcome daily challenges and more important traumas. 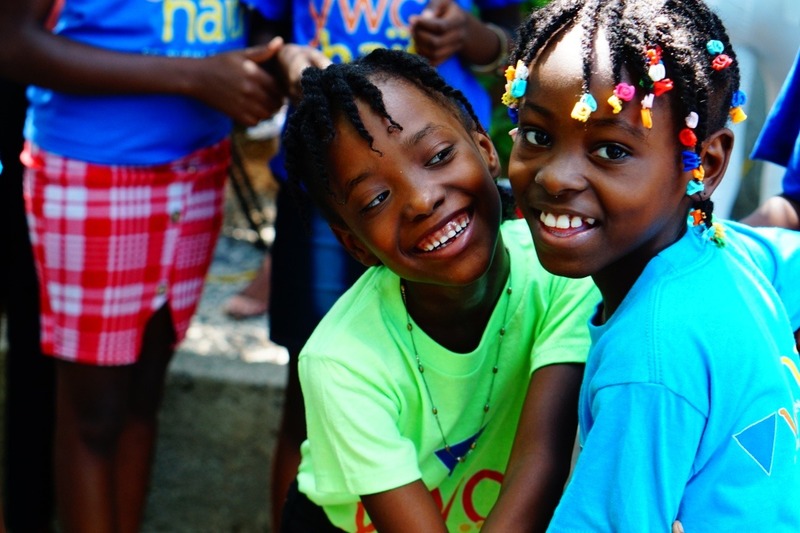 • YWCA Haiti's on going programs: after school tutoring programs, life skills training, women's leadership training, one to two hot meals per participant, per day, nutritional kits for families. • Institutional capacity building and reinforcement.